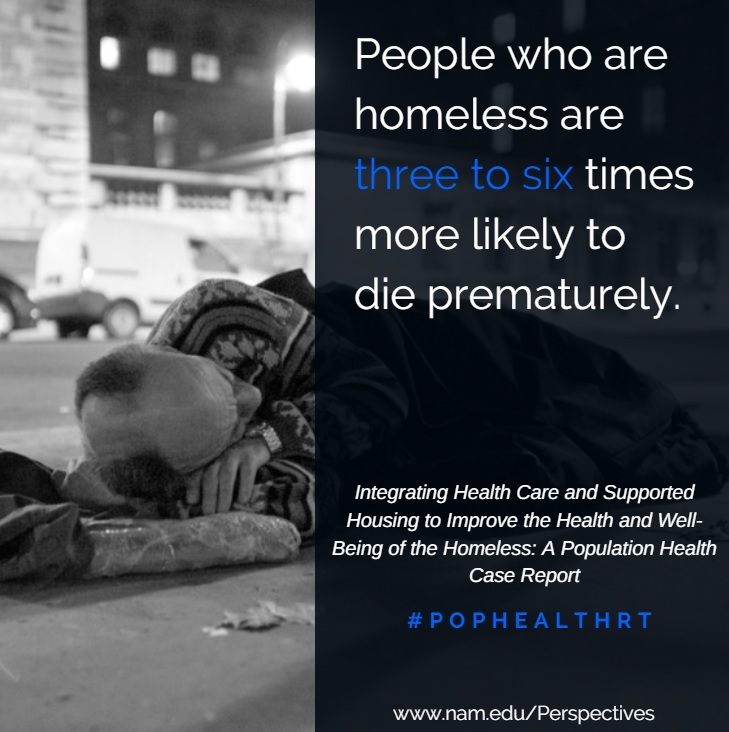 Poor health is both a cause and a result of homelessness. According to the National Health Care for the Homeless Council (2008), people who are homeless are three to six times more likely to become ill than those with stable housing and three to four times more likely to die prematurely. The average life expectancy in the homeless population is estimated to be between 42 and 52 years, compared to 78 years in the general population (Colorado Coalition for the Homeless, 2012; Whitbeck, 2009). For many reasons, individuals who are homeless and need medical treatment do not receive it. Barriers to health care among homeless individuals include inability to pay, lack of knowledge about where to seek treatment, lack of transportation, difficulty completing forms, and self-consciousness about appearance and hygiene when living on the streets. Consequently, many homeless people use hospital emergency departments as their primary source of health care (Whitbeck, 2009). Underuse of preventive and primary care services leading to mostly unplanned interventions in more costly settings contributes to poor health outcomes, high health care costs, and inadequate coordination of care for this high-need population subgroup. Each year, an estimated 1,250 to 1,500 individuals are identified as homeless in Allegheny County, Pennsylvania. UPMC for You is a Medicaid physical health managed-care organization operating in Allegheny County. As an insurer, UPMC for You does not have direct access to information regarding the housing status of its members. However, through interactions with medical providers, hospital discharge planners, and members and families themselves, the UPMC for You medical care coordination staff have determined that, at any given time, approximately 40 to 50 of its Medicaid or Special Needs Plan (both Medicaid and Medicare eligible) members are homeless and have high health care spending resulting from unmet health care needs. Although staff would typically refer such members to local housing programs, placement was often delayed because of long wait lists. Moreover, ongoing efforts to adequately coordinate care for these members were hindered by a lack of established communication channels between the U.S. Department of Housing and Urban Development (HUD) and the UPMC for You Medicaid plan. In an effort to bridge these gaps, between 2008 and 2009 UPMC for You organized a series of discussions with the Community Services section of the Allegheny County Department of Human Services. Leaders and staff of both organizations identified the mutual goal of integrating health care, housing, and related support services as an important means for helping Medicaid or Medicare-Medicaid-eligible homeless adults to be successful in community settings. Through additional engagement of Community Human Services, Inc., a local HUD vendor that provides an array of housing and related support services, and Metro Community Health Center (Metro), a federally qualified health center “look-alike” center currently operating in the Pittsburgh community of Swissvale, the Cultivating Health for Success program has been operating since January 2010. Have at least 1 year of high total health care expenditures, including unplanned services. The program is structured to impact the health care of eligible members positively through a collaborative, team-based approach that integrates three interrelated components—permanent supported housing, an assigned medical home, and intensive case management/care coordination—as described below. In combination, these components ensure that all program participants have stable housing and social supports, timely and coordinated medical care, in-home assistance with activities of daily living and more consistent medical monitoring, and basic life skills training. Community Human Services, Inc. has been providing permanent supported housing for eligible UPMC for You members since the start of the program. With funding from UPMC for You, a fulltime master’s-prepared social worker at Community Human Services, Inc., in collaboration with a mobile registered nurse (RN) from Metro (see below), works exclusively with these members to provide assistance with securing housing of each member’s choice, stabilizing social supports, assuring timely medical care from Metro, coordinating care with specialists (including behavioral health providers), and managing the HUD contract. Specific responsibilities of the service coordinator include assisting members to obtain furniture, bedding, and other basic supplies needed to establish permanent housing; making appropriate food selections based on dietary restrictions as needed; and accessing relevant community resources, such as local food banks. Given that transportation to health care providers is often a barrier for this population, Community Human Services, Inc. supplies bus tickets, or the service coordinator (or Metro RN) arranges for emergency transportation supported by UPMC for You for critical appointments. The service coordinator also supports members in independently managing their financial obligations, including payment of the program fee (i.e., a portion of their rent depending on income). The Metro Community Health Center offers a unique patient-centered medical home experience for all members enrolled in the program, with a special focus on health and wellness and management of chronic conditions. Members are scheduled to see their Metro primary care physician every 6 months. The practice also sets aside designated hours each week for members to drop in without an appointment to address needs or concerns that arise between their scheduled appointments. UPMC for You pays the practice a monthly care coordination fee as well as the usual fee-for-service payments for any direct medical services rendered by physicians or other practitioners. The Metro Community Health Center also provides a full-time, community-based RN, funded by UPMC for You, to work exclusively with members in the program. Specific responsibilities of the RN include conducting a comprehensive, strengths-based assessment with the member on entry into the program; obtaining the member’s consent to share physical and health information between providers and with UPMC Health Plan; and attending visits with members to assist with communication of primary issues and needs, especially for those with low literacy or cognitive impairment. In collaboration with the member and his or her physician, the RN also develops a comprehensive care plan, including referral to health promotion activities, such as tobacco cessation, behavioral health support, and disease management programs offered through UPMC Health Plan. The RN visits each member in the individual’s new home at least monthly to assess the member’s ability to follow the care plan; facilitates medication adherence by encouraging the use of pill boxes, reminder alarms, or coordination with the member’s pharmacy to supply medication in blister packs for members who are challenged by filling a pill box with multiple medications; reinforces teaching about the member’s chronic conditions; and assesses the member’s ability to monitor and report glucose levels or blood pressure. The RN is notified by UPMC Health Plan about enrolled members who have a physical or behavioral health admission and/or emergency room visit. The nurse visits members who are hospitalized and coordinates care with inpatient staff to facilitate a smooth transition to home or a skilled nursing facility. From January 2010 through December 2014, 64 UPMC for You members participated in the Cultivating Health for Success program. More than half of these individuals had at least three or more severe chronic conditions, and 69 percent had at least one of the top five chronic conditions, including a high-risk behavioral health diagnosis (47 percent), chronic hepatitis or liver disease (36 percent), and epilepsy (27 percent). Consistent with other research focused on emergency department visits and hospitalization, during the 12 months after referral, UPMC for You staff observed an increase of 18 percent of unplanned care in members enrolled in the program compared to those in usual care. Members in the program also experienced higher rates of primary care visits during the 12 months after referral and twice as many provider interactions compared to similar members in usual care. In particular, all enrolled members had at least one primary care provider visit compared to only 84.8 percent of usual care members (p = .005); the interaction rate among enrolled members was 45,383/1,000 compared to only 28,459/1,000 for usual care members (p = .001), with phone calls making up 79 percent of the interactions. Equally important, more than half of the members who were ineligible for the program because of low prior health care cost increased their spending, and 65 percent had unplanned care during the coming year, suggesting an opportunity to curb future medical health costs by intervening earlier in the member’s service use trajectory. At present, there is one federally funded program, Health Care for the Homeless, which is designed specifically to provide primary health care to homeless persons. Given that housing is widely recognized as the first form of treatment for homeless people with medical problems—both preventing illness and helping those who are ill to recover—more health care services designed to serve the homeless are clearly needed (National Health Care for the Homeless Council, 2009). Cultivating Health for Success offers an integrated approach for addressing this critical public health challenge and could be replicated in other communities. Through this initiative, UPMC for You has been able to offer a unique “value proposition” for its members who are homeless: substantially subsidized rent (based on the member’s income) in return for the member’s agreement to develop and maintain a clinical and supportive relationship with a local primary care provider and collaborate with UPMC for You care coordinators who provide resources and information. In addition, the member can secure housing, with some choice over the location of the apartment, and receive assistance with relocating. Because all program participants are Medicaid eligible by virtue of their low-income status, they are able to receive maximum subsidies. The collective expenditures on clinical and care coordination services paid by UPMC for You (i.e., the Community Human Services case manager, the Metro mobile RN, the care coordination fees, and the medical costs for participants) are accrued as matching funds for the HUD subsidies. Cultivating Health for Success is likely to have a positive impact on the Medicaid- and Medicare-Medicaid-insured homeless individuals in our community for some time to come. With unexpended HUD subsidies available in the third year of the program resulting from initial delays in filling program capacity, UPMC for You and its partner agencies, including HUD, agreed to continuation of the program, which is currently serving 47 individuals. In anticipation of the sixth year of the HUD funding commitment, beginning November 2015 the project has already been renewed for at least one year. UPMC for You and its partners look forward to continued opportunities to enhance the design of this initiative, draw on past experiences to more accurately identify participants who are likely to be successful, and share lessons learned with other communities seeking to address the negative health impacts of homelessness. Colorado Coalition for the Homeless. 2012. Homelessness and health. http://coloradocoalition.org/!userfiles/Library/Homelessness%20and%20Health_final.pdf (accessed December 22, 2015). National Health Care for the Homeless Council. 2008. The basics of homelessness. http://www.nhchc.org (accessed December 22, 2015). Whitbeck, L. B. 2009. Mental health and emerging adulthood among homeless young people. New York: Psychology Press. John Lovelace is the president of UPMC for You. The views expressed in this Perspective are those of the author and not necessarily of the author’s organizations or of the National Academy of Medicine (NAM). The Perspective is intended to help inform and stimulate discussion. It has not been subjected to the review procedures of, nor is it a report of, the NAM or the National Academies of Sciences, Engineering, and Medicine. Copyright by the National Academy of Sciences. All rights reserved.